How many cloud drives do you own? If you have accounts in several of the cloud storage services, say four different accounts, won’t it be troublesome to manage them? MultCloud is a central management platform presented by AOMEI. It mainly serves for the users who have multiple cloud drives. They are allowed to manage all the files of their cloud drives through just one single account in MultCloud. The web service supports cloud storage services like Dropbox, Google Drive, OneDrive, Amazon S3, SugarSync and so on. MultCloud is a free service which enables you to manage, move, copy and migrate files and folders between all your cloud storage services with just a few clicks. This kind of synchronization between cloud services increases the reliability and availability of your data as a whole. MultCloud 3.0 beta makes your files transferring more conveniently and fastly. This can move or transfer files form one cloud to another for better realizing the file transfer operation among multiple cloud drives without downloading to local. For example, through MultCloud, you can directly copy the files in Google Drive and paste to OneDrive, and this process will be accomplished online. 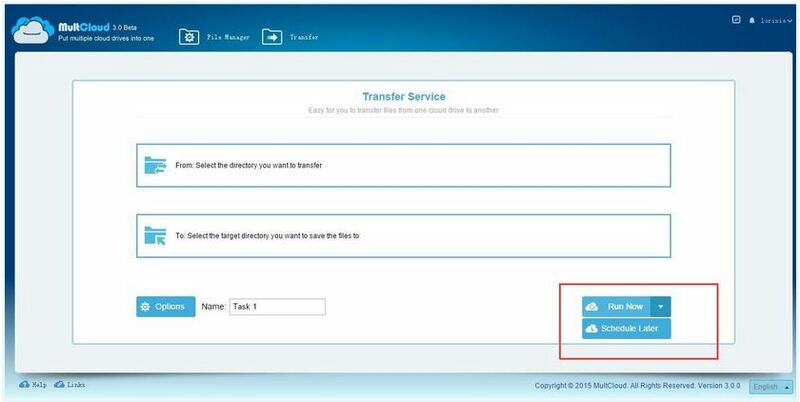 MultCloud uses the new background of transmission technology, making the files transfer doesn’t need to start the computer, that is to say, in the case of power off, MultCloud can also realize the transmission from a cloud drive to another. You only need to Copy and Paste, then MultCloud server will achieve everything for you. If you encounter that some files may need to backup regularly, for example, make a data transferring on the last day of every month. MultCloud supports scheduled transfer function. It allows you to set the daily, weekly or monthly in the specific time for data transmission. It also supports to send an email to you after completing the transmission and inform the result. You can also receive an email notifications after the transfer is completed, as the whole process will run in background while you can safely close the browser. In order to improve the data transmission speed and stability, MultCloud uses Multi-server parallel transmission technology, which makes the file transferring success rate increased by 200%. Under the multiple servers working at the same time, we also don’t have to worry about the server crashed and other anomalies. In a word, it gives you more at ease use.